On Wednesday, September 23rd, 2015, Bernard Reitmann parked his Mercedes SUV at the Highline Trailhead, not far from Granite Hot Springs, in Northwestern Wyoming. From there, no one was quite sure where he went, but they did know what he had with him: half a sandwich, a bright blue rain jacket, a bottle of Arrowhead water, a hunter-orange ball cap, his rifle. At the end of the day, when 84 year-old Bernard didn’t report back, his wife and daughter drove out to that remote trailhead to look for him. Two days later I was there, with Teton County Search and Rescue and a few dozen other Park and Forest Service employees, looking for Bernard. The Clues were scarce: almost immediately someone found a deer, shot to death, but not field-dressed. Did Bernard shoot that deer, chase it downhill, and get lost? Or trip and fall and break his leg? We had no idea. Even though he had a known heart condition and was on blood-thinners at the time, we still didn’t have evidence that his heart had taken him out. To be sure he was following his heart if nothing else, hunting alone in grizzly country at his age and in his condition. So indirectly, yes, I think that in at least a metaphorical sense his heart had a lot to do with the predicament he’d gotten himself into. By the end of the first day, after grid-searching in teams of ten, and running five dog teams through the forest, and flying two helicopters above the local vicinity, we still hadn’t found him. We were all kind of surprised. And we all wondered what old Bernard was up to that night. Luckily for him, if he’s still alive, it’d been unseasonably warm, even though in Wyoming that’s still pretty cold. We were expecting lows in the mid-forties. By the third day, more people had joined in the search, including Bill Lee, who’d lived in this area for decades and was in charge of Search and Rescue for Shoshone County, over the range to the east. “Do you have much of a mountain lion presence here?” he asked. “This place is famous for its cats,” I said. In unison, we looked into the tree tops, squinting into the sky. 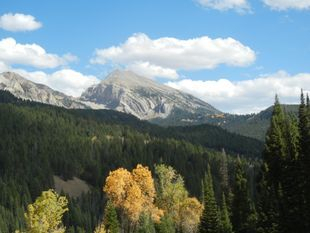 But we didn’t see anything but beautiful yellow aspen leaves falling through the crisp fall air and the dark blue sky against slate grey mountains with names like Antoinette and Pinnacle Peak. Scotty Gunther, the person in charge of search and rescue for Grand Teton National Park and his one-year-old cadaver dog, a mixed yellow short hair, had also joined the search. If I were ever going to break my leg in the backcountry, this would be the best day to do it. I felt safe as a man can be in the woods of Teton County, which is still only relative. Our assignment that second day was to find grizzly kills and dig them up, to make sure they were only deer and elk in those earthen mounds and not any German hunters. Cody had a thick, dark mustache, mirror-sheen Magnum P.I. sunglasses, and he was carrying a large, black hunting rifle. “I thought we weren’t supposed to have weapons out here,” Kyle asked. “Ya, well,” Cody said, “We’re gonna dig up bear caches, so…” The rest of the sentence was unnecessary. But we didn’t find Bernard in those piles, only the back half of a small elk, bits of blood and flesh and fur still clinging to those white bones. “Or we just missed him,” I said. We both looked back toward where we’d just been. “But that’s kinda hard to believe.” We were all trying hard to summon our inner seer. One such seer had already called in with advice, as they almost always do. She could sense that our man Bernard was between trees and water. And we all believed her, not that we felt we could see the future, too, or that we believed in her powers. Treed mountains surrounded us, flowing with creeks and rivers in all directions. That could be anywhere. I ran about eight different scenarios through my mind, figuring each had about a twelve percent chance of being the right one. The following Tuesday, a hunter came across a rifle in the Boulder Creek Drainage. He picked it up and GPS’d the spot, then, when he made it back to the trailhead and realized a search was underway, reported it to authorities, who went out there, to that obscure canyon, easily six or seven miles from Bernhard’s vehicle, and found Bernhard. He was tucked behind a log, not far from the trail. He’d covered himself in vegetation in an effort to stay warm. They guessed he hadn’t made it through the first night. And yes, he was between a tree and water, I can guarantee that without ever visiting the site. In a tight canyon, a man is always between trees and water.